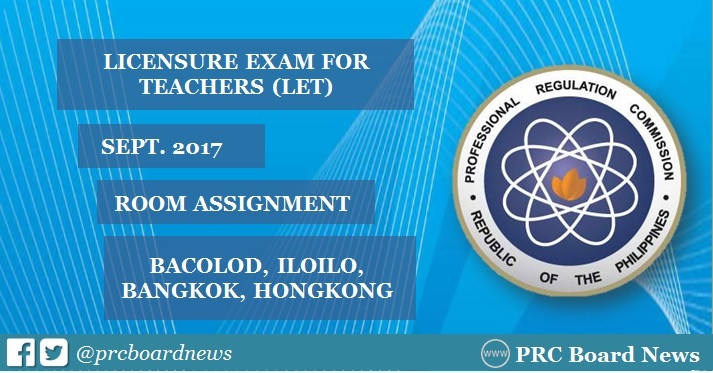 The September 2017 LET - Licensure Exam for Teachers or teachers board exam room assignments have been released by the Professional Regulation Commission (PRC). Check out on this page for Bacolod, Iloilo and Special Professional Licensure Exam (SPLE) in Bangkok, Thailand and Hongkong testing centers. LET, one of the biggest licensure exams being handled by PRC, is expected to amass more than 150,000 total takers (Elementary and Secondary) for the second LET this year on Sunday, September 24, 2017. On the same date of exam in the Philippines, PRC will also conduct the Special Professional Licensure Examination (SPLE) for Professional Teachers for overseas Filipino workers (OFW) in Bangkok, Thailand and Hong Kong.